SOSHANGUVE – ECONOMIC Freedom Fighters (EFF) leader, Julius Malema, has expressed solidarity with Zimbabweans and other African nationals ahead of the forthcoming elections in neighbouring South Africa. The Pan African opposition party leader was speaking at the election manifesto launch in Soshanguve, north of Pretoria over the weekend. “Let us stop xenophobia,” Malema appealed to party followers. “The problems of Zimbabwe are our problems. We call on (Zimbabwe President Emmerson) Mnangagwa to respect democracy. Democracy is not elections, but human rights,” Malema added. Malema said a hatred of nationals such as Batswana, Ghanaians, Mozambicans, Nigerians, Zambians or Zimbabweans equated to self-hate. “Africa is one. We will not allow anybody to divide us. 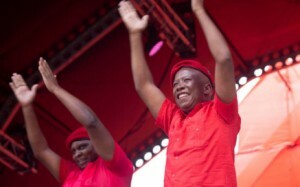 Let us help Africa regain its mineral resources…..land,” Malema said. “Whether they (whites) like it or not we are going to take back the land. We cannot postpone the land question. We cannot postpone the jobs question. The economy is in the hands of white minority. We want to change that,” said Malema. He urged Africans to unite and make the continent formidable. Malema pledged to provide jobs for youth if the EFF was elected into power. “The party understands that almost 40% of South Africans do not work. We are going to create jobs! We are going to open factories with zero tax zones for companies who pay well and employ locals,” he said. Meanwhile, President Cyril Ramphosa also launched the African National Congress’ (ANC) election manifesto in Kimberley, Northern Cape. He also promised to create jobs and fight crime in the townships.